The US Navy's submarine bases are some of the most high-security installations in the world, but one of their most important and shadowy submarine outposts is not located along the ocean, but rather in a lake in landlocked Idaho. The Navy's Acoustic Research Detachment (ARD) at Bayview, Idaho, which is some 375 miles from the ocean, is where new submarine and surface ship shapes and subsystems are tested in a sub-scale environment that closely mimics the ocean. In other words, ARD Bayview is the Navy's lower-key subsurface Area 51, and massive Lake Pend Oreille is a water based, smaller, and more outsider friendly Nellis Range Complex. The lake's depth (it's deeper than Loch Ness at about 1150 feet), large size, clear water and quiet conditions provided by steep tree-lined shores and a flat muddy bottom, along with a constant chilly temperature under 100 feet, are all key factors that have made it such an attractive testing location for the US Navy since WWII. Also, the lake stays remarkably calm for its size, allowing for fantastic testing conditions. The truth of the matter is that this small base has supported every major submarine design development of the last 65 years, from exotic hull shaping and acoustic dampening treatments, to high-end passive and active sonar systems. Much of this testing is done using a large network of extremely sensitive hydrophones placed in key locations on, or tethered to, the bottom of the lake. Since these listening devices can even hear rain on the lake's surface, and in some cases to stay out of sight, the most sensitive testing is done late at night. The main testing area is called the Intermediate Scale Measuring System (ISMS) which is a 1,000 foot diameter circle of hydrophones mounted on the bottom of the lake or suspended via buoys. This array is paired with an amplified sound projector array and an elaborate control barge on the surface above. Within this massive circle, sub-scale test articles are put through their paces and all of the information collected is piped via a fiber-optic network to a ground control and interpreting station over a dozen miles away back at Bayview. Even particular pieces of machinery that are going to be installed on submarines can be tested inside one of the Navy's miniaturized test subs so that its overall acoustic impact can be gauged. In many ways the ISMS is watery version of the US Navy's Missile Engagement Test Arena and Radar Cross-Section measurement facilities, as it is a controlled environment created to evaluate a vehicle's signature and sensors in a three dimensional manner. 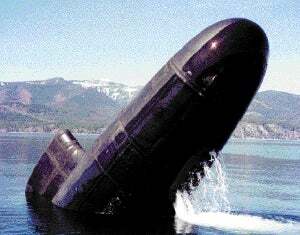 The Buoyant Vehicle Test Range is used to measure the sound that the forward sections of a submarine design, mainly its bow, makes while moving through the water. This is done by towing the test article out to the range and winching it down to the bottom of the lake and then releasing it. Similar to an emergency ballast blow on full scale subs, this test allows for very detailed acoustic data to be gathered as the submarine is moving through the water just via buoyancy, not its own propulsion or a tow-line. As it nears the surface the sub's dive planes are directed down so that it doesn't rocket out of the water at such an angle that it flips over or destroys itself. Testing using the BVTR has allowed for better bow sonar acuity and quieter subs, so pretty much two of the most important things when it comes to modern combat submersible design. The Large Scale Vehicle Range (LSVR) is probably the most exciting of all the Navy's Acoustic Research Detachment's capabilities. This is where the 1/4 scale submarines, which usually closely resemble operational subs of both past and present, go out and run through their paces under their own power. Here many items can be tested, such as a boat's wake signature, new sail designs, propeller noise, new sub-scale propulsion concepts and propulsor configurations and a design's active handling capabilities. This micro-sized submarine base in the northern tip of Idaho has its own fleet of sub-scale submarines and ships that are purpose-built for range testing. Over the last 50 years or so, various designs have come and gone, some that were more basic canvases for which the USN could paint their techno-dreams, and others that are up to 1/4 scale mock-ups of boats currently, or soon to be in service. There are two known Large Scale Vehicles currently in service at ARD Bayview, although some sources say there are at least ten in inventory. The LSV-1 Kokanee is a 1/4 scale model of the Seawolf Class of American subs, of which three are currently active within the US Navy. She is 90 feet long and ten feet wide and is packed with batteries, generators, computer guidance systems, telemetry recorders and propulsion equipment. Just because the Kokanee is a sub-scale sub does not mean it is a wimp when it comes to speed. She packs 3,000hp! The second known Large Scale Vehicle is the $50M pride and joy of the base known as LSV-2 Cutthroat. She is larger than Kokanee, more closely resembles the Virginia Class of US fast attack submarines, and is more advanced in every respect. In fact she is the largest unmanned submarine in the world at 110 feet long. She was designed to be modular in nature and large parts of her hull can be switched in and out for various testing purposes with relative ease. She is driven by a state-of-the-art permanent-magnet, radial-gap electric propulsion motor that can put out up to 6,000hp. Both of these LSVs are built to run autonomously or semi autonomously and are guided using an advanced autopilot. This allows them to prowl the lake during tests without an umbilical harness attached, which greatly enhances test results during experiments where acoustic interference is a major issue. In 2005 the ARD got its first sub-scale surface vessel to operate and test, known as the Advanced Electric Ship Demonstrator (AESD), or by its sexier moniker "Sea Jet." Sea Jet is a 1/4 size functioning model of the Navy's DDG-1000 Zumwalt Class Destroyer that features a trapezoidal design and a unique tumblehome hull. This hull configuration is highly controversial as analysts have noted that it may be less than stable in rough seas or during high-speed maneuvers. The Navy did do their homework before deciding to move forward with DDG-1000's unique configuration, and most of this homework was done at the ARD's parent unit, the Naval Surface Warfare Center located in Caderock, Maryland. Here the DDG-1000's hull-form was tested in the facility's giant wave-pool and using a sub-scale model on the Potomac River. It is rumored that Sea Jet also provided key testing duties regarding the Zumwalts configuration and that the results were satisfactory enough to proceed with the tumblehome design. Sea Jet uses a shrouded and totally submerged impeller drive design known as the "Under Water Discharge Jet." This rudderless concept is designed and built by Rolls Royce and Sea Jet can hit speeds of up 18kts when it is running at full power. This fully submerged propulsion design is said to be much quieter and efficient than traditional screw and rudder based surface combatant propulsion setups. It also features a much smaller wake. Like its submersible cousin, Sea Jet was built to be adapted to new missions and experiments without major overhaul. After all the test points were completed with the Rolls Royce propulsion concept, the ship was used to test General Dynamics "Rimjet" electro-magnetic podded drive system which could greatly change the way Surface Combatants' are propelled through the water in the future. Sea Jet's design is so strange looking from afar that a picture of it was taken from a distance, and it started a rumor that there was a sea monster prowling the waters of Lake Pend Oreille. The non-creature in question was dubbed "The Paddler" among monster chasers and interested locals alike. The reality is that "The Paddler" legend goes back many decades, to a time when the facility was highly classified due to the constant fear of Russia's intelligence apparatus. Surely some people fishing or boating on the lake probably did indeed see some strange wakes or objects under the surface of the water, which were test articles not monsters. Some say "The Paddler" story was part of a grand disinformation campaign by the US Navy in an attempt to keep its operations on the lake under wraps. This may have been true decades ago, but it is probably not the case today as the DDG-100/CG(X) design has been public knowledge for some years prior to the latest "Paddler" sighting. In addition to these three large scale test boats, many other smaller scale articles are used on the various ranges for testing, which possibly including models that portray our adversaries submarine designs. A series of elaborate barges that are fitted with cranes and wet-docking areas also tow the test articles out to the ranges and service them while deployed. A portion of these barges are also outfitted with elaborate command and data-collection interfaces to be used with certain tests. The Navy's Acoustic Research Detachment in Bayview, Idaho is all about saving the Navy billions of dollars in their quest for a more perfect submarine and surface combatant. It is almost fiscally impossible to build one-off prototype submarines anymore as the investment in dollars would be in the billions. ARD does the same testing for what is probably a tiny fraction of the cost, which allows for many more tests and experiments to be done, even with highly exotic concepts that are of a high risk nature. In the end, this means more rapid innovation of key capabilities that will allow America to keep its edge below and above the seas. From testing an entirely new hull-form, to evaluating a the acoustic signature of a toilet pump, it's bewildering just how many types of tests ARD can perform. Now that they are introducing a surface combatant capability to their unique testing stable it will be interesting to see how much faster new technologies make it to the Navy's surface fleet. The Navy's testing grounds on Lake Pend Oreille are so valuable and important to the future of America's ability to project power that it has been called "the US Submarine force's most important body of water" by Admiral Edmund Giambastiani, who was the head of the Navy's submarine warfare group at the time of the quote. Interestingly enough, similar claims have been made about the USAF's shadowy Area 51 test-base, which is also located on another big lake, albeit a very dry one. So next time you see a new mast shape on an America nuclear sub, or you hear about some fantastic technology that makes our boats quieter than the rest, you can be almost certain that the innovation in question was plowing the still waters of Lake Pend Oreille with the Acoustic Research Detachment at the helm long before it ever sailed on the high seas. For more on the ARD Bayview and its unique fleet click here, here and here.